After analysing 17 billion measurements, across 500,687 devices between July 1st and September 30th, OpenSignal has published their 7th State of LTE Report, and there are strong indications about India’s 4G revolution in their findings. Testing speed and availability of 4G network across 78 countries, OpenSignal’s State of LTE report is one of the most followed reports on 4G speed and services across the globe. As per the findings of this report, 4G LTE revolution has gripped India, and the catalyst which triggered this massive usage is none other than Reliance Jio. In terms of 4G LTE availability, India was ranked #24 last year, but this year, we have been ranked #15, which is the biggest improvement shown by any country. As per the report, 81.6% of India is right now able to receive 4G LTE network services, and this way, we are better positioned than countries like UK, Canada, Australia, UAE and several European countries where 3G is still the most used network. 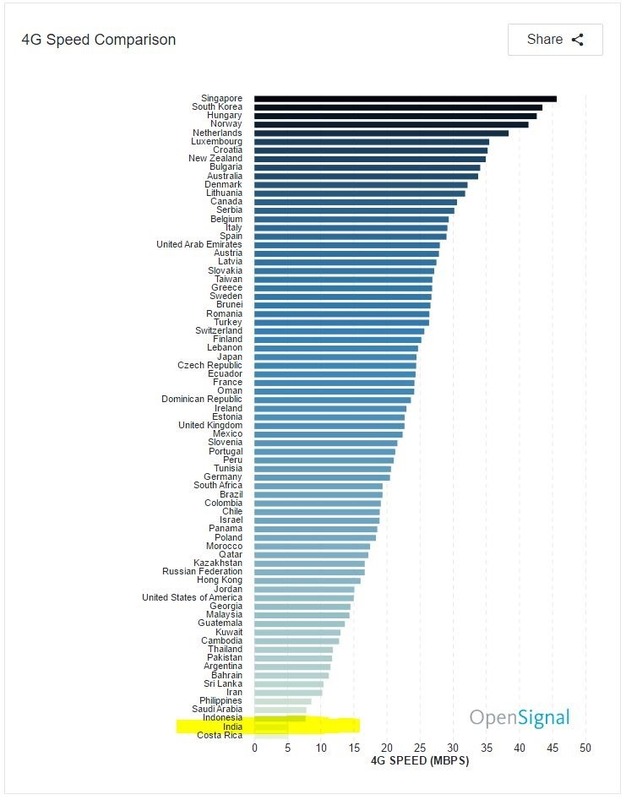 South Korea has the world’s best 4G availability across the world, followed by Japan and USA. Ireland, Ecuador and Sri Lanka have the worst 4G availability. OpenSignal has openly, and warmly acknowledged the role played by Reliance Jio in triggered 4G LTE boom in India. In fact, it is rare for OpenSignal to credit a revolution in telecom services to any one particular service provider. But the might and disruption created by Jio forced OpenSignal to highlight this fact. The only dark spot in this report, vis-a-vis to India’s performance in 4G LTE adoption and usage is the speed factor. 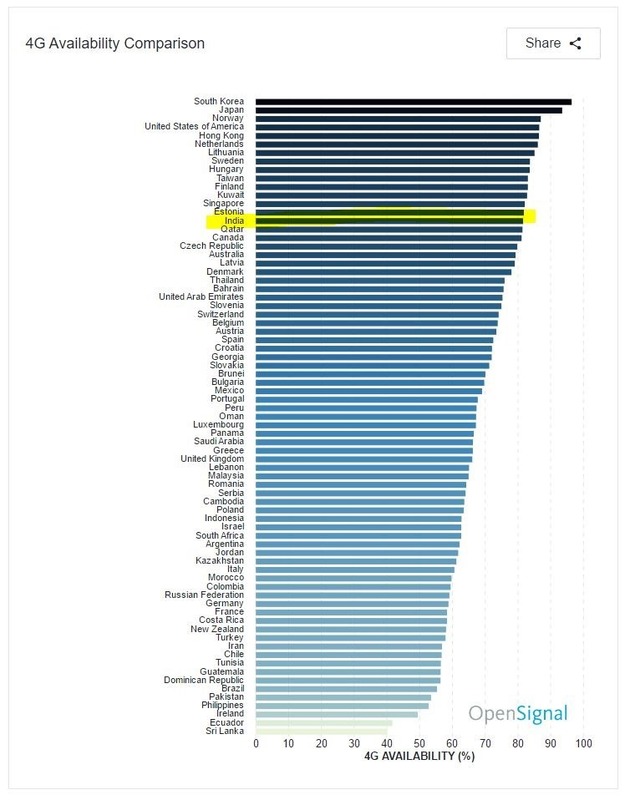 In fact, in the overall ranking based on 4G speed, we have been ranked right at the bottom of the chart, and a tiny country named Costa Rica is the only country which has worst 4G speed than ours. Singapore is world’s #1 country when it comes to 4G speed, while South Korea, Hungary and Norway are at #2, #3 and #4 position. In fact, the report also mentions that the problem of speed is a major concern globally, and even countries like the US and Hong Kong has below global average speed in LTE domain. Overall, 16.2 Mbps is the global average of 4G speed, and only 45 countries have 20 Mbps or above speed in 4G network. "India Has Better 4G Coverage Than UK, Canada, Australia; Jio Hailed As The LTE Catalyst For India", 3 out of 5 based on 4 ratings. WhatsApp Brings Photo Filters, Image Album Creation and Swipe-to-Reply Features in its Latest Update! Can Apple HomePod Challenge Google Home & Amazon Echo? We Find Out!